There were many ways of maintaining the morale of a fighting man, but the simplest of these was the eagerly awaited letter from a soldier’s girl. 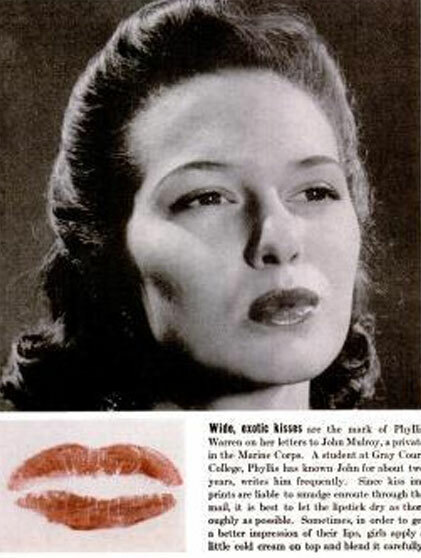 A common message of love from a girl to her fella was to place lipstick kisses on the letter and on the envelope seal. How romantic is that !? 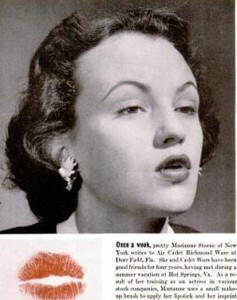 These images were service men’s girls picked at random from around New York. To get the best imprint possible the girls would usually press the letter against their makeup mirror to stiffen the kissing surface ! Marianne writes to Air cadet Richmond Ware and uses a small makeup brush to apply her lipstick and her imprint on back of envelope is delicate and well formed. Phylliss writes to private John Mulroy. 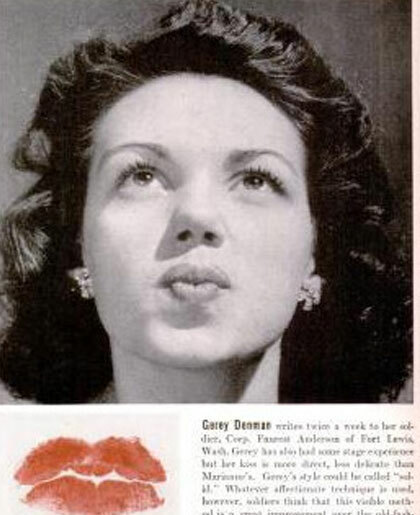 Since kiss imprints are likely to smudge enroute, it is best to let the lipstick dry before enclosing. 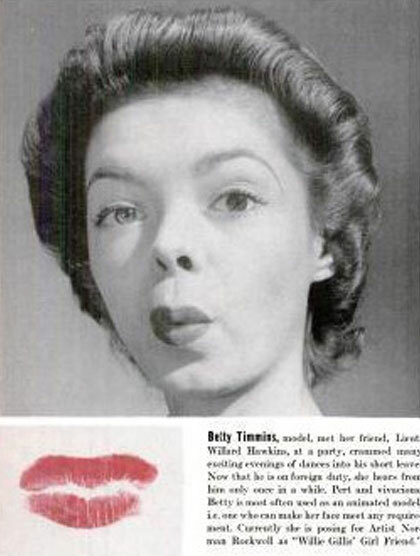 In order to get a better impression of their lips, girls apply a little cold cream on top and blend it carefully. Blonde bombshell Pat Ogden’s letters go to Lt Robert Deen. a navy doctor. 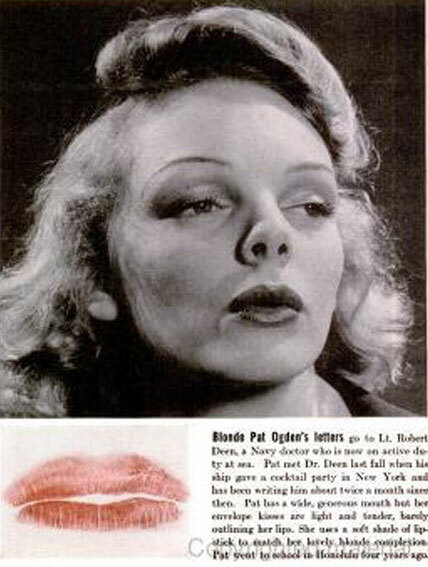 Pat has a wide generous mouth but her envelope lisses are light and tender, barely outlining her lips. she uses a soft shade of lipstick to match her lovely blonde complexion. 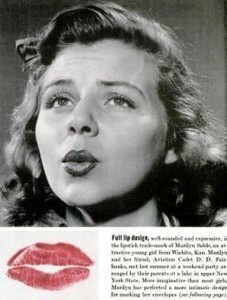 Full lip design, well rounded and expressive, is the lipstick trade mark of Marilyn Sable from Wichita to Aviation cadet D.D Fairbanks. Lucile’s rosebud design is small but effective. she made it by pursing the lips to a point, then pressing them steadily against the back of the envelope until the lipstick is transferred. 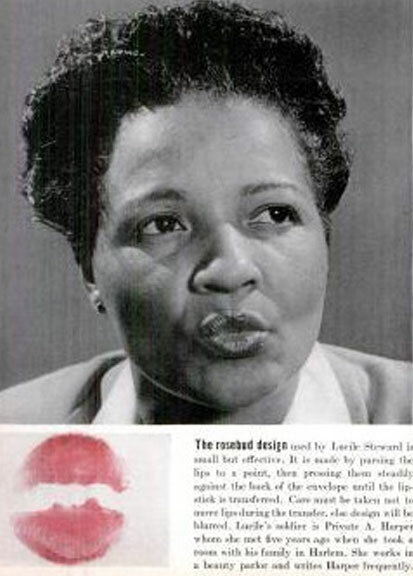 Lucile send her kisses to Private A Harper from Harlem. Lucile incidently works in a beauty parlour. 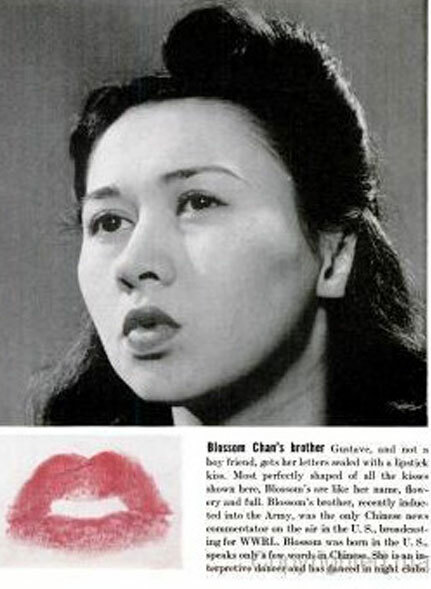 Blossom Chan, a nightclub dancer sends her kisses to her brother gustave and seals her letters with a kiss. gustave is the only Chinese news commentator on the air in US war broadcasts !